Good morning, Red Strike fans! Thanks so much for your Shockingly Good support on the t-shirt promotion. We were out within hours! Here is the next one! Just click on the Free Red Strike tab, fill out the information for your coupon. It will come to you by email and you can only print it once. 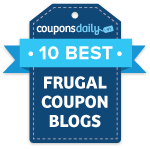 The coupon is good until 11/30/10 but the offer may not last that long. Have a great day! 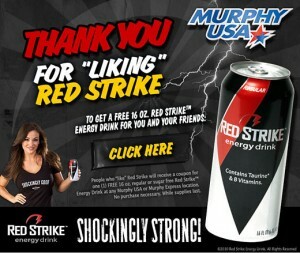 ‘Like’ Red Strike on Facebook, click on the ‘Red Strike’ tab and fill out the form to get a coupon valid for a FREE ‘Shockingly Good’ Red Strike Energy Drink! The coupon will be sent to you via email. Offer is valid only in the 23 states in which Murphy USA and Murphy Express have stores (AL, AR, FL, GA, IA, IL, IN, KY, LA, MI, MN, MO, MS, NC, NM, OH, OK, SC, TN, TX and VA.